The 10 species varied 10-fold in body mass, 15-fold in hind limb muscle mass, and about 2-fold in muscle mass-specific power output both during running and jumping (Table 12.1). 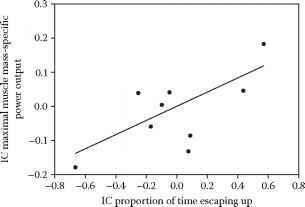 As for interspecific variation in field behavior, the degree of arboreality varied between 45 and 100%, while the incidence of escaping upward varied between 27 and 100% (Table 12.1). The 10 species of Anolis lizards differed significantly in muscle mass-specific power output (two-way ANOVA, species effect, F9178 = 9.76, p < 0.0001) (Figure 12.3). 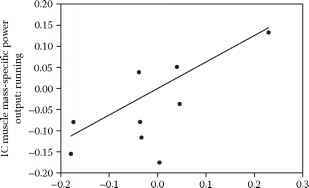 Muscle mass-specific power output, however, did not differ between jumping and running (two-way ANOVA, locomotor mode effect, F1178 = 0.06, p = 0.80), and the difference among species was similar in both locomotor modes (two-way ANOVA, locomotor mode-species effect, F9178 = 1.56, p = 0.13). Additionally, the contrasts in muscle mass-specific power output during running were positively correlated with the contrasts in muscle mass-specific power output during jumping (r = 0.86, F1,8 = 6.94, p = 0.030) (Figure 12.4). A multiple regression model (backward method) with the independent contrasts of maximal muscle mass-specific power output as the dependent variable and the independent contrasts of SVL, degree of arboreality, and proportion of time escaping upward as independent variables was performed; only an analysis of the latter independent variable was found to be significant (r = 0.68, F18 = 7.05, p = 0.029). Thus, only the variation in (contrasts in) the relative numbers escaping upward explained a significant proportion of the variation in (contrasts in) maximal muscle mass-specific power (Figure 12.5). Separate bivariate regressions showed the same results, i.e., only the contrasts in proportion of time escaping upward show a significant correlation with the contrasts in maximal power output. In the two-species comparison, muscle-mass specific power output differed significantly between A. carolinensis and A. valencienni (two-way ANOVA, species effect, F131 = 4.71, p = 0.038), and the interspecific difference in muscle mass-specific power output varied significantly according to locomotor mode (two-way ANOVA, locomotor mode-species effect, F131 = 4.88, p = 0.035). Muscle mass-specific power output during running, however, did not differ significantly from the muscle mass-specific power output during jumping (two-way ANOVA, locomotor mode effect, F131 = 0.12, p = 0.73). Because there were no significant differences in power output between locomotor modes, only between species, we further compared muscle mass-specific power output for each locomotor mode separately between the two species using one-way ANOVA. During running, muscle mass-specific power output did not differ between A. carolinensis and A. valencienni (oneway ANOVA, F126 = 0.94, p = 0.34). Muscle mass-specific power output during jumping, on the other hand, was significantly greater in A. valencienni than in A. carolinensis (one-way ANOVA, F121 = 5.31, p = 0.031). Note: Given are the number of individuals (N) and — where applicable — means and standard errors (mean ± SE) per species. a Observations of behavior are of females only. We were unable to gather data on males for this species. 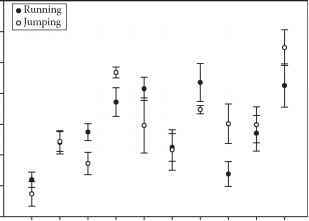 FIGURE 12.3 Mean and standard error of muscle mass-specific power output during running (closed symbols) and jumping (open symbols) per species. Species are ordered from low to high incidence of escaping upward when confronted with a (human) predator. FIGURE 12.4 Regression through the origin of the independent contrasts (IC) of muscle mass-specific power output during running against the independent contrasts of muscle mass-specific power output during jumping (r = 0.86, p = 0.030). 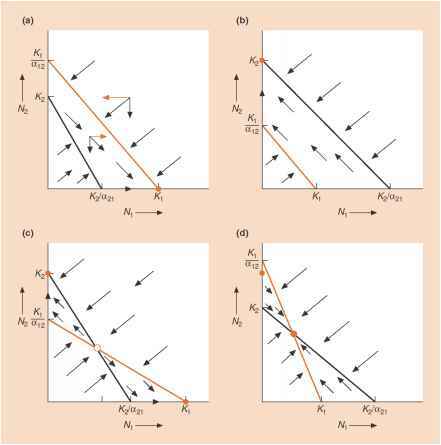 FIGURE 12.5 Regression through the origin of independent contrasts of maximal muscle mass-specific power output against the independent contrasts of the proportion of time lizards escape upward (r = 0.68, p = 0.029). Evolution toward higher incidence of escaping upward has been parallelled by evolution toward higher power outputs among the 10 Anolis species. in A. valencienni, the knee and ankle angle in this species were significantly smaller than in A. carolinensis (Figure 12.6).